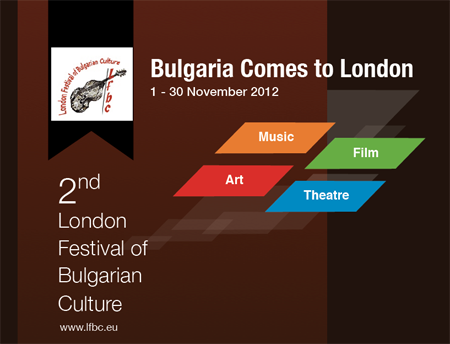 The 2nd London Festival of Bulgarian Culture will be held in the British capital from 1 – 30 November 2012, in partnership with the Bulgarian Embassy in London and the Bulgarian Cultural Institute in London. There will be over 20 events – concerts, theatre, cinema, and exhibitions presented in a number of central London venues. The 2nd London Festival of Bulgarian Culture will be held throughout November 2012. In the period of 30 days the London audiences will be able to get a ‘taste of Bulgaria’ and its culture – there will be 11 symphony and chamber music concerts, 3 choirs, 3 jazz and folklore concerts, 2 exhibitions, 2 film screenings and 2 theatre performances. ‘Our ambition is to outgrow the success of our first Festival back in November 2010!’ says the violinist Ivo Stankov, initiator and organiser of the festival. In 2012 the concerts will be held in halls in and around central London. Some of the festival’s partners are London Jazz Festival in partnership with BBC Radio 3, the Bulgarian Cultural Institute and the Bulgarian Embassy in London. The programme will feature some of the long standing and most established Bulgarian performers and orchestras such as the Varna Bulgarian State Symphony Orchestra, and the Big Band of the Bulgarian National Radio. A rare chance to hear in London the internationally renowned pianist Boris Bloch is a highlight in the programme, as is the London based Chillingirian Quartet. ‘We will also present to the audience as many as 10 world, UK and London premieres, with an accent on Bulgarian composers. Some of the finest composers of the 20th century such as Vladigerov, Nenov, Goleminov and Kazandjiev, will be premiered in the UK. This is rather a historic event, given the fact that they worked all their life behind the ‘Iron Curtain’ during the communist regime and so didn’t have the chance for their music to be performed elsewhere. World premieres from the younger generation of the finest Bulgarian composers such as Martin Georgiev and Gheorghi Arnaoudov will also be presented, with a special mention of the Bulgarian/British composer Dobrinka Tabakova’s London premiere of her piece ‘Moreni’. The festival will take place at Cadogan Hall, St. John’s Smith Square, King’s Place, The Clapham Grand, St James’s Piccadilly, the Bulgarian Cultural Institute and the Bulgarian Embassy in London. Festival goers will also have the chance to enjoy some fantastic high-end cuisine at one of London’s top venues, the fashionable club/restaurant Dstrkt on Piccadilly Circus presented by the award –winning Bulgarian Chef Georgi Yanev. There will be great menus on offer (exclusive dinner/concert packs) specially designed by the Chef for this occasion – ‘A taste of traditional Bulgarian cuisine with a contemporary twist’. The festival is also supporting the Bulgarian community in London. It is offering free tickets to the children attending the Bulgarian schools in London and to their parents to attend the concerts presented as part of the festival. Theatre, exhibitions, dance, film screenings and special events will also be presented at the Bulgarian Cultural Institute in London, offering a lot more to complete a presentation of Bulgaria’s culture and arts as never seen before in the capital. The festival is a partner with the Bulgarian Embassy in London, the Bulgarian Cultural Institute in London, Bulgarian Ministry of Culture, Varna Municipality and London Jazz Festival in partnership with BBC Radio 3. You will find the full programme and additional information about the Festival on the official festival website - www.lfbc.eu.